PHOENIX — If your Labor Day weekend plans involve heading out on the water, stay safe and boat or paddle responsibly by wearing a life jacket. It’s a simple step, but one that can be life-saving. Wearing a life jacket not only provides immediate protection for the boater, but also may save an operator from receiving a citation. State law requires all passengers 12 years old and younger to wear a life jacket while on board and each passenger must have a properly fitting, U.S. Coast Guard-approved life jacket available. Are paddlesports more your thing? Kayaks, canoes and paddleboards are considered watercraft, and users are legally required to have a wearable personal flotation device on board. To increase safety for everyone on Arizona’s waterways over the holiday weekend, AZGFD officers will be on the lookout for reckless operators, passengers 12 and under who are not wearing a life jacket, and people operating a boat or watercraft while under the influence of alcohol and/or drugs. 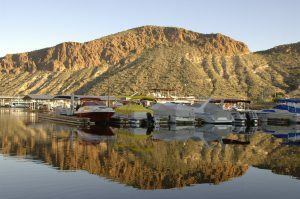 Although the legal limit for operating a boat in Arizona is a .08 blood-alcohol concentration, an operator is in violation of the law and may be prosecuted for operating a watercraft while impaired to the slightest degree by alcohol and/or drugs. So far in 2017 there have been eight fatalities on Arizona’s waterways, and alcohol was a contributing factor in half of them. Get more information about staying safe as well as instruction on trailering your vessel, navigational rules and legal requirements by taking a free boater or paddlesports education course from the AZGFD. Signup online at www.azgfd.com/Education/Boating/.